Listed is a 2006 Dodge Ram! It is a clean carfax certified vehicle! It is priced well below NADA book value! It will not last long in inventory! It is Automatic drive, has power windows, power mirrors, power locks, leather seat and AM/FM radio!!! We provide quality pre-owned vehicles to all of our neighbors in Newport News, Hampton, Williamsburg, Yorktown, Poquoson, and all of Hampton Roads. We are sure that once we handle your needs for a vehicle the first time, we'll be your Hometown Dealer for your entire family, friends, relatives, and acquaintances. If we do not currently have what you are looking for in stock, we will get with you and ORDER YOUR NEXT USED VEHICLE online. We offer a full range of Bank financing, Credit Union financing and our special In-House financing, with rates as low as 2.99%, to help those of our neighbors affected by today's economy. WE ARE HERE TO SERVE YOU, OUR NEIGHBORS, FRIENDS, AND CUSTOMERS! Call Today to set up an appointment or test drive! Dont Pay Retail, Pay Wholesale!!! 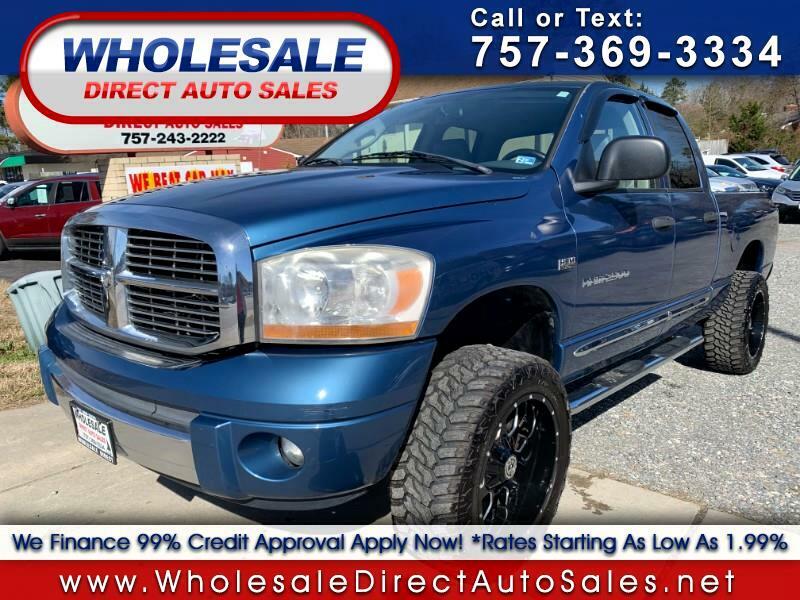 Visit Wholesale Direct Auto Sales online at www.wholesaledirectautosales.net to see more pictures of this vehicle or call us at 757-369-3334 today to schedule your test drive. Message: Thought you might be interested in this 2006 Dodge Ram 2500. WE HAVE BANK FINANCING, MAJOR CREDIT UNION FINANCING, AND INHOUSE FINANCING AVAILABLE!!!!!!!!!!!! WE HAVE RATES AS LOW AS 1.99% AVAILABLE FOR THOSE CUSTOMERS WHO QUALIFY!!!!!!!!!!! WE HAVE FINANCING AVAILABLE FOR EVERYONE'S NEEDS!!!!!!!!!!!!!! My name is Alan Updike, and unfortunately, it became necessary to look for a new used car to replace my 2003 Chevy Tahoe Z71 with 215k miles on it. I was truly blessed to see the perfect vehicle to meet my needs at Wholesale Direct Auto Sales. I drove down from Williamsburg to the lot on Jefferson Ave in Newport News to check it out. It was a white 2004 Chevy Tahoe Z71 with only 75k miles on it, (to be honest, I thought it was a typo, the mileage could not be that low). I was fortunate and blessed to meet Colton Crabtree, (who I had spoken to on the phone). He gave me the keys to the 04, got the vin number off of my 03 and left me alone to check out the car, while he went to determine the trade in value of my Tahoe. Feeling I was interested in the car, I gave him the information for a finance app. After checking out all the electronics of the 04, I headed out for a test drive. By the time I got back, the finance approval was in. There were a couple of items that I had noticed with the vehicle and upon my return, spoke to Colton about them. He was never defensive, was totally accommodating and addressed every concern I had. I was never pushed into anything at all, the experience in dealing with WDAS and Colton was so much more pleasant than I could ever have imagined in my wildest dreams. Both he and WDAS much much more exceeded my every expectation in every conceivable aspect of purchasing a used car.  There is no doubt, I will have no issues in recommending Colton and Wholesale Direct Auto Sales to folks I don't know who ask me about the car, to my friends, and even to my family members. The experience that my wife and I had, was the best experience we have ever had in purchasing ANY car, and being 64 years old, I have bought a car or 2 in my lifetime. Thank you again for such a wonderful experience. I am so very glad to have found a used car dealer who was more interested in customer satisfaction than the stereotypical just get the car off the lot used dealership! They worked hard to get me in the car I wanted. I am extremely please with the service! We purchased a 2010 dodge journey and we are absolutely happy. Colton was super helpful and tried to get us the best deal possible. He made the process so pleasant and the entire staff was great with our crazy 2 year old!! Great experience, Colton was a gentleman and even when when had a problem with the bank and had the money the next day he borrowed us a car so we can continued moved around!! This was the best car buying experience I've ever had. Colton and Dickie worked with me to get me in the car I really wanted. I would refer this place to anyone looking to get car with no hassle or pushy salesmen!! Thanks again for all of your help!!!! Colton and Dickie were superb! Colton went out of his way to make this Jeep buying experience phenomenal. Dickie was very friendly and makes you feel right at home. If you want to deal with honest people, that aren't pushy, are knowledgeable, and just friendly people to deal with, check Wholesale Direct out! Very well priced, and they were very straight up. If you're looking for a quality used vehicle, you should stop by and check them out! If I were to buy another used vehicle, they have my business! At Wholesale Direct Auto Sales we are proud of the quality used cars we sell and our dedication to serve the needs of our customers. This is reflected in the amount of repeat business we receive. Whether this is your first purchase with us or one of many that you’ve had, you can count on our dedicated sales staff to make it the best buying experience possible. Dealer was very easy to work with. Allowed me to take the vehicle to my mechanic and have it looked over before buying. I prearranged this deal with the dealer. Just wish we were able to negotiate the price. The markup is low on these vehicles since they cater to a different buyer. Since the vehicle checked out mechanically, the price was still under book value and the mileage was low for the year, I decided to buy. The paperwork took less than 15 minutes! 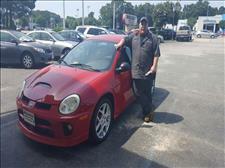 I would consider buying other cars from Wholesale Direct Auto Sales!